« Which family policies do we need to diminish the motherhood penalty? This event is organized by the Confederal Group of the European United Left/Nordic Green Left (GUE/NGL). GUE/NGL through the Spanish party “Podemos” (one of the new anti-austerity parties in Spain). At present there are two different directives in the EU that are completely disconnected. One is the Directive on Maternity leave (under DG health), providing a minimum of 14 weeks with no loose of earnings for mothers. On the other hand, the Parental Leave Directive (under DG Employment) provides an equal period of time for each parent (4 months), but this period does not have to be paid and only 1 month has to be non-transferable. 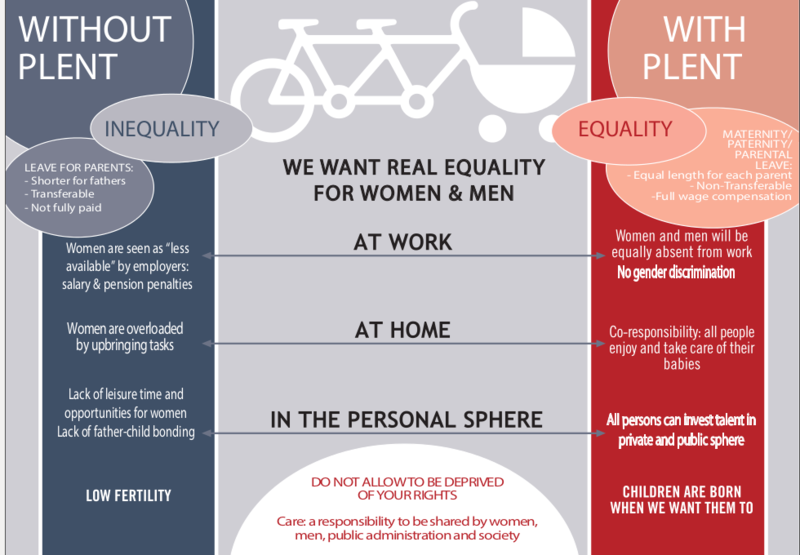 So, despite the “equality” and “protection” appearance, all kind of leaves in these two directives are actually designed for mothers and not for fathers: maternity leave because it is literally for mothers; parental leave because it is not paid and/or transferable. And we know that fathers do not overwhelming take leave in those cases. Many people are used to think that more leave for women is good. But, in fact, this system reproduces the sexual division of work which is so harmful to women. 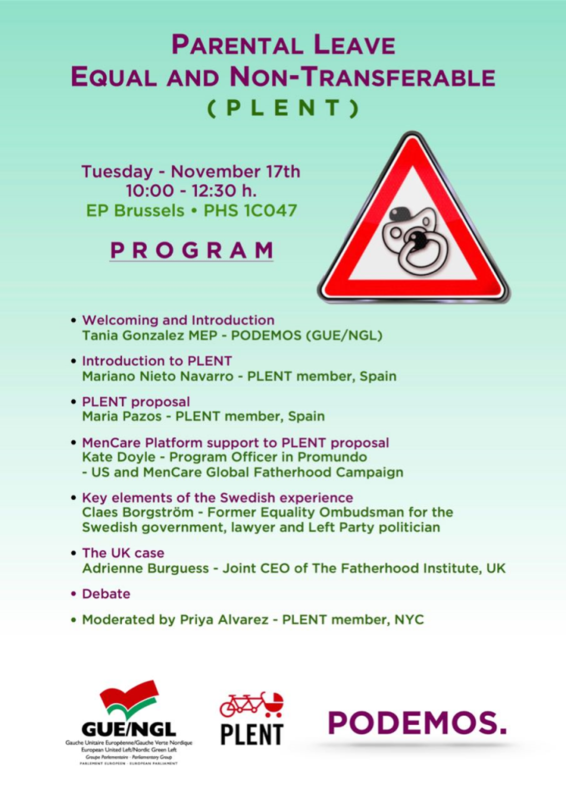 PLENT is a feminist platform which has been working on this subject for many years, researching and discussing. We have reasons and scientific evidence to support the PLENT proposal that we will present there. Our idea is just explaining and discussing why we need a design of parental leave in all countries so that it is, for each parent, equal, non-transferable and fully paid. The existing EU legislation on (parental/paternity/maternity) leaves (Directives 92/85/EEC y 2010/18/EU) is not coherent with the EU Commission’s goal of ensuring gender equality in the labour market nor with equality in childcare. In fact, mothers are ensured a 14-week leave keeping their remuneration, while fathers are not entitled to any remunerated leave but only a 4-month parental leave without guarantee of remuneration and, for the most part, transferable. As a matter of fact, the majority of fathers take up their available leaves if and only if they are well remunerated and non-transferable (Directive 2010/18/EU, intro paras 16 y 20). Does the European Commission plan to replace the existing two Directives for a single Directive ensuring the right of each parent to enjoy a leave of equal duration, non-transferable in its entirety and without any economic loss in order to promote effective equality in the use of parental leaves?